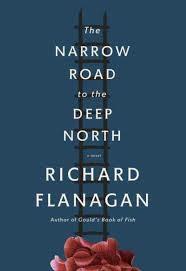 a book chick: "The Narrow Road to the Deep North"
my take: An interesting blend of literature and World War II. The main character Doriggo loves to read and always keeps a book next to his bed. He meets the love of his life in a book store one day while on a pass from military service waiting to be shipped out to the war. The title is from a Japanese poem and poetry is quoted throughout. Equally represented is the brutal and subhuman conditions of Australians building the train line in the jungle between Burma and Thailand called the Railway of Death. The book is a tough read in terms of oppression and an interesting look at how the POW's and captors moved on after war's end. Good discussion in Susan's backyard for our book club meeting.